Lard is a popular baking ingredient among the Amish and it is regaining popularity among home bakers as a cheap alternative to shortening. 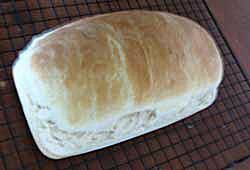 This Amish white bread is a great recipe for beginners and for people who are just learning to bake with lard. In large bowl, mix warm water and yeast. Add milk, sugar, salt, and lard. Stir. Add 4 cups of flour and mix well. Add in enough remaining flour to make a dough that follows the spoon around the bowl. Turn dough out onto lightly floured surface and knead for 10 minutes, adding more flour as needed until the dough is firm and smooth to the touch. Place dough in medium greased bowl. Turn dough over in bowl so that the top is also lightly greased. Cover with clean cloth and let rise in warm, draft-free place for 1 hour. Punch down dough. Turn dough out onto lightly floured board and knead for 5 minutes or until the bubbles are out of the bread. Divide dough into 2 equal parts. Shape each dough half into a loaf. Place each loaf in greased, 9 X 5-inch bread pan. Cover and let rise in warm, draft-free place for 45 minutes or until doubled in size. Brush melted butter on loaves. Bake bread at 350 degrees F for 40 minutes or until bread top is golden brown and the bread sounds hollow when the top is tapped. Remove breads from pans and let cool on rack. Learn how to make braided rolls with these pictured instructions. Learn how to make swirl rolls with these pictured instructions. There is a milk to dry milk powder conversion table. Use it to figure out how much dry milk to add to the water when replacing the milk in the recipe.